MEN AND WOMEN OF THE DISTRICT. and to immortality. . . .
as eagles haunt the mountain air. ICHABOD WRIGHT was born in 1767. He was the son of Ichabod Wright, an ironmonger, who in 1761 founded a bank on Long Row, and died in 1777 when his son was 10 years of age. The son very early took an active part in all Nottingham local matters, and was therefore in 1791 admitted a freeman of the town. He served as Captain Commandant of a troop of Volunteer Yeomanry Cavalry, when in 1794 it was enrolled for the safety of the kingdom then endangered, and many years later he presented the "Mapperley Cup" as a prize for the best marksman in the Robin Hoods. The land called Mapperley Park having been under the Inclosure Act allotted to him, it being largely an old enclosure, he built the hall, and about 1794 enclosed the outer park. He may be described as the founder of Carrington. He gave the land for the National School, and for the Church, paid the rent for the Vicar's house, and he and his brother John Smith Wright, were the principal benefactors, in which efforts all the Wright family joined, by hand, heart and purse. He died in 1862, in his 96th year, beloved and respected. On his last two birthdays four generations were all present There is in Basford Church a stained glass window to his memory, erected by subscription, and another in Carrington Church. MRS HARRIETT MARIA WRIGHT, the wife of Ichabod Wright, gave the altar in Carrington Church, and her daughters cooperated in various gifts, including the pulpit. Mrs. Wright looked forward with lively anticipation to the opening of the church for which she had heartily worked, but at the consecration in 1848, the Bishop of Lincoln had to ask for the prayers of the congregation, for she was in her last earthly trial. Hers was the first funeral in the church, and she was buried in the family crypt under the church. She was a veritable "Mother in Israel," for she had ten daughters, and three sons, who at her death, after 50 years of married union, had an urn made, and fixed in the Hall Grounds, in order to remind them of their mother's goodness, beloved and lamented, and when the Hall was sold, Mr. Fred Wright had the urn removed to the churchyard, and it now stands by the side of the door. JOHN SMITH WRIGHT, named above, took a prominent part in establishing the Mechanics'Institution, the Ragged School, and many other philanthropic works. He laid the foundation stone of Holy Trinity Church, and gave £600 towards the erection. "In his hands" says Bailey, "wealth was a trust," and he honorably discharged it. He died in 1848, aged 74, and there is a memorial window in the church. His second wife was The Dowager Lady Sitwell, of Rempstone Hall, and she founded the Midland Orphanage and Industrial Training Institution for Girls, at Lenton. and in 1839 he addressed a twelve page pamphlet as an open letter to the Directors and Proprietors on the subject of Sunday travelling. He protested against the conveyance of crowds of people who assembled at Beeston station on the Sabbath, requiring extra trains to convey them to Nottingham, and the large employment of servants rendered necessary by Sunday trains. He said he preferred to run the risk of unpopularity, and the loss if need be, rather than violate the precept as to the observance of the day as one of rest. He gave the land for the National School at the junction of Hucknall Road. He died in 1871. aged 76. His wife, the Hon. Mrs. Wright, actively engaged herself in Church work. Colonel CHARLES ICHABOD WRIGHT was for a short time M.P. for Nottingham, and for fourteen years was Colonel of the Robin Hoods. He gave the land for Carrington Vicarage, and for St. Jude's Church. He was a good amateur musician, especially with the 'cello and cornet. He died at Hartendale, near Farnham, Surrey, in 1905, aged 76. HENRY SMITH WRIGHT, M.P. See "Lenton," page 19. In addition to what is there named, he wrote "The Psalms in Verse," Part II., his father having written Part I.
JOHN SCORE, of Carrington, about 1845 left sixty guineas in trust, to distribute the proceeds every Christmas among distressed widows and orphans of the Methodist Society in Nottingham. There is a tablet in Halifax Place Schoolroom. The Charity is duly administered by Mr. J. Ellis. ANTHONY HERVEY was the author of a beautiful little story entitled "The Sherwood Gipsy," which passed through forty-seven editions. It tells how that he, being a Sunday School Superintendent, rose very early on Sunday morning, June 9th, 1844, and before going to his school took a walking circuit by Mapperley Common, where gipsies were encamped, when he engaged in a conversation with one of them, Matilda Harrison, a lovely girl of seventeen, who was hanging clothes out to dry, and was evidently suffering from consumption. The conversation is given revealing to her the way of salvation, and copies are given of subsequent letters. She died near Maidstone in the following March, her spiritual nature opened, developed, happy. Mr. Hervey was a framework-knitter at Carrington, and became a missionary to the inmates of Collins' and Labray's Almshouses He died in 1850, at Wilford, and there is a monumental stone to him in the General Cemetery. SAMUEL BEAN resided at Cavendish Hill. He was, as a lad, wild, and untaught, and afterwards enlisted in the Derbyshire Militia, and later on learned dyeing, at Mr. Nunn's, in Hounds Gate After marrying a lady with property, he entered into the silk trade, and as Bean & Johnson, became a considerable employer of labour. He took great interest in the Anti-corn Land League, and subscribed largely to its funds. He represented St. Ann's Ward in the Town Council, and was made an Alderman The Nottingham Date Book says that "throughout his life he was a useful, consistent, honorable citizen." He died in 1860. One of his business speculations was the building of the large warehouses in Commerce Square, having below them what was then regarded as superior lodging houses, in Narrow Marsh. The REV. DAVID WHALLEY became Vicar—Incumbent it was then called—of Carrington in 1849, and in 1866 he became Rector of St. Peter's, and died in 1870, aged 56. Near the south porch of St. John's is a monument which states "This monument erected by his parishioners and friends, as a token of the affectionate regard which they entertained toward him. and of their high estimate of his ministerial character and labours." In his day the morning service was so well attended that a stranger had a difficulty in getting a seat. The REV. H. P. H. BURCHELL-HERNE, M.A., of Trinity College, Cambridge, and whose residence was Bushey Grange, Watford, Herts., was in 1870 ordained to be Curate of Carrington, and worked there till 1872, residing up Mapperley Hill, but received no salary. Nevertheless, when the chancel and organ chamber were added to Carrington Church, Mr. Herne gave the organ and lectern. He died recently. The REV. T. HART DAVIES, M.A., was the first Incumbent of Holy Trinity, 1841-51, and lived on Sherwood Rise, having retired from the Army with the rank of Captain. His services in Nottingham were much valued, and his wife was a thorough Pastor's helpmeet, energetic, and ever ready to act in furtherance of the work. He left Nottingham to become Archdeacon of Melbourne, Australia, and returning to England he was for 20 years Vicar of Christ Church, Ramsgate. He died in 1878, aged 76. WILLIAM SIMKINS was a lace manufacturer. By energy and skill he secured a competence, and devoted much time to the public good. From 1846—until his death—for 30 years he was Churchwarden, in which capacity he was constantly consulted by the poor in their domestic troubles and difficulties, and being of a generous nature he gave largely, almost more than he could afford; and of course he was sometimes imposed on by persons who had brought their troubles on themselves. He died at 333 Mansfield Road. 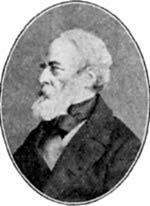 WILLIAM JAKMAN was for forty-five years the Actuary of the Nottingham Savings Bank, during which the Institution gradually developed. Let the figures speak for themselves. Mr. Jarman was appointed to the management in 1827, in which year the depositors numbered 3,100, and the amounts due to them were £95,943. In 1872, when he retired, the figures were 18,594 depositors, and £461,412 the amount. It may be named here that the progress has been continued, being in 1912, 40,482 persons and £1,239,398. A testimonial was presented to Mr. Jarman by the Trustees, February 29th, 1872, and may now be seen suspended on the walls of the bank, in which they testify to his integrity, courtesy, kind, friendly, and sensible advice given to Depositors, and this was signed by the President, Treasurer, twelve Trustees, and eighty-two Governors. He resided near Yew Tree Avenue on Mansfield Road, Carrington, where he had a Dairy Farm, and as a recreation he had also for arable purposes, the Plains Farm, Mapperley, where he was fond of making agricultural experiments as to seeds, manures, &c., keeping the land in thoroughly good condition. He on one occasion sent a cart load of Swede turnips to be exhibited in Nottingham Marketplace; 160 turnips, each a stone weight (14 lbs. ), so making a ton. He died in 1876, aged 84.